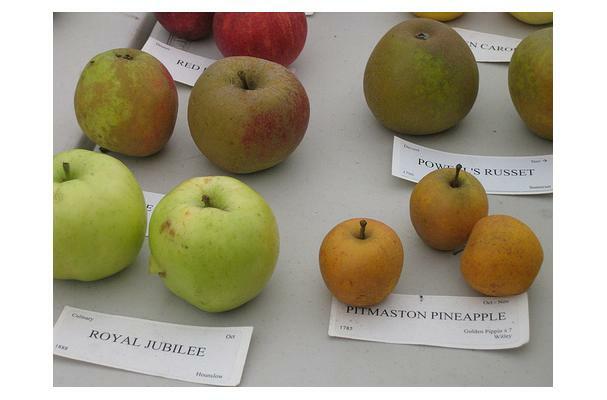 PITMASTON PINEAPPLE has the synonyms: Pitmaston, Pineapple, Pineapple Pippin, Pitmaston Pine and Reinette d'Ananas. Likely, a seedling of Golden Pippin grown in 1785 at Whitley, England, by a Mr. White, who was steward to Lord Foley. It was introduced by the nursery Williams of Pitmaston, England. It is a class of old, russeted, English dessert apples, between 1 to 2 inches in diameter, and very sweet and highly aromatic. Usually conical in shape, it is a golden-yellow covered with a fine, fawn-russet, and the yellow flesh is juicy and sugary with a rich, pineapple-like flavor. Its flavor is sometimes described as honey-like. The skin is covered with conspicuous russet dot lenticels and is very dry. It ripens in late September.